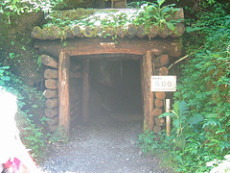 The remains of Iwami Ginzan Silver Mine is in Ota City, situated at the center of Shimane Prefecture. There are 3 areas. - Remains of silver mine and siliver-mine town. In 16th century, the Age of Geographical Discovery, it is said that almost one third of silver in the world was produced in Japan, and most of Japanese silver was produced in Iwami Ginzan. The map made in Europe at that time shows how big the influence of Iwami Ginzan because it is largely picked up within Japan. More than 600 remains still exist even now in the Iwami mountain area. The characteristics of Iwami Ginzan is that they neither broke the mountain nor but down the forest. It was very ecological way of mining just to dig the narrow tunnel. It was valued as world heritage because this is the industrial remain which coexisted with the natural environment. Followings are the main sightseeing spots. It is the biggest tunnel in Iwami Ginzan It was named after the first magistrate Okubo. It was developed from Edo era to Meiji era. The hight of the tunnel is maximum 5m and the regend says that Magistrate Okubo entered the tunnel on horseback with spear. It is completely dark in the tunnel unless you have a flashlight. The real cutted walls, very deep hole which seems to reach to the center of the earth the high ceiling of the hole are daunting. To visit the Okubo-mabu, you have to join the tour. Ryugenji-mabu was developed in 1715 under the direct management of magistrate's office. It is 600m long and the second longest tunnel after Okubo-mabu. You can enter the visiting area of 273m. You can see the wall cut by the chisel. And the ancient documents of Iwami Picture Scroll is exhibited on the way which shows the atomosphere of the ancient time. It was opend in 2008 to show the whole image of Iwami Ginzan to the visitors. You can see how they produce the silver by the film and exhibition of artifacts and pannels. 500 Rakans were completed in 1766 after 25 years of manufacturing to console the ancestors who died in the silver mines started by the monk Gekkaijoin. Rakanji Temple was built to protect these rakans. If you cross the stone curved bridge, you can see three caves. Threre are 501 rakan sculptures in the caves of both ends. Omori Town in Otashi was the center of Iwami Ginzan Territory. The inhabitants tried to maintain the atomosphere of the ancient time. Not only the Remains of Magistrate's Office and old temples and shrines, you can see the retrospect post office, bank, automatic vendors and so on. The house of Kumagaya Family was the old marchant house. It is designated as Important Cultural Property. Kumagaya was one of the most influential families and thier affairs were not only mining and sake brewing but also examining the silver-tax, You can enjoy the ambience of ancient time by visiting the accounting office, kitchen, things for the wedding, etc. * There is very few buses so please check the timetable beforehand.